Fr Hunwicke's Mutual Enrichment: Nostra Aetate (4): Is the Two Covenant Theory a necessary revolution? We have seen that the Two Covenant Theory, the idea that Jewry alone is guaranteed Salvation without any need to convert to Christ, is repugnant to Scripture, to the Fathers, even to the post-Conciliar liturgy of the Catholic Church. It is also subversive of the basic grammar of the relationship between the Old and the New Testaments. Throughout two millennia, in Scripture, in Liturgy, in her classical teachers, the Church of East and West has relied on the hermeneutic of typology ... the relationship between the OT Type and the NT Antitype which fulfills and replaces it. Even non-Christian intellectuals and scholars can understand this. Frank Kermode, in his 1975 classic The Classic gives as examples "Christ makes Jonah the type of his resurrection, and S Paul the crossing of the Red Sea by the Israelites a type of baptism". He goes on: "A type can therefore be identified only by its antitype, a later event in a providentially structured history; the Old Covenant is a type of the New. Types are essentially what Auerbach has in mind when he speaks of figurae, events or persons that are themselves, but may presage others. Their purpose, to put it simply, is to accommodate the events and persons of a superseded order of time to a new one." 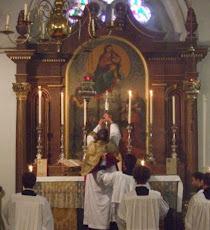 If those who attack 'Supersessionism' get their way, shall we any longer be allowed at Benediction to sing Et antiquum documentum/ novo cedat ritui or, during the Mass of Corpus Christi, ... novum Pascha novae legis,/ Phase vetus terminat.//Vetustatem novitas,/ umbram fugat veritas,/ noctem lux eliminat; all about how 'the Old', 'the Shadow', 'the Night; must give way to, or is put to flight by, 'the New', 'the Light', 'the Truth'? The Two Covenant Theory, lamentably, has spread so far and so wide that good and well-meaning people speak and write as if it were true, and may hear it even when it is not spoken. Jorge Bergoglio, in a document which is non-Magisterial, wrote "their covenant with God has never been revoked" (EG247). This statement echoed a remark obiter of B John Paul II. Such a formula can and should most certainly be situated in a Magisterial context in which it can be understood and justified (I plan to do this in two later posts). I would be perfectly content to say it myself. But I would feel uneasy if I did not explain further what I meant. Pope Francis wisely followed it by the contextualising remark two paragraphs later that "the Church cannot refrain from proclaiming Jesus as Lord and Messiah". I very much hope that readers read this with as much care (and lengthy thought) as they did his previous remark. If they did so, damage will not have been done. For all men and women, without exception, Christ is Saviour. To be continued in just two final posts. Blessed John Paul II created some well-founded consternation when he said that the covenant with the Jews had never been revoked. However, he clarified his comments during his trip to Sydney when he affirmed that he was speaking about the Abrahamic covenant - not the Mosaic covenant. Bob Sungenis has a video on the internet in which he goes into this at great length. This seems to me a very high price to pay for giving a puff to the more intolerant among the Jewish community (particularly those who are so intolerant that they even require Christianity to change as a prerequisite for dialogue). Has the Catholic Church ever demanded changes in the liturgy of the Jews? What exactly is dialogue with the Jewish people for? His view is clearly very nuanced: the Old and New are not two entirely distinct Covenants, but rather two phases of a Covenant God made with Israel and which now embraces all nations. The "Old" derived its efficacy only insofar as it looked forward to Christ, and it still derives whatever efficacy it retains from Him. If Jesus Christ is true for me, He is true for ALL people. I would like Father Hunwicke to expatiate on the "covenant not being revoked comment. It has been superceded but not revoked, ie it has served its purpose and therefore didn't need to be revoked. Am I right about this or not? Actually (and I'm not an expert on this), my understanding is that historically, a Middle Eastern covenant was not really a revocable contract. It was a declaration that A and B were now family to each other. Breaking a covenant called down curses upon oneself, but it didn't make you not family anymore. At any rate, if a more powerful party (like a king with a big empire, or God) declared covenant with a less powerful party (like a single city, or Israel), the more powerful party set all the initial terms, and could augment the terms however he wanted. The more powerful party had all the paterfamilias power, and the less powerful party was in the position of a child or a subordinate clanmember, depending on the particular terms of the covenant. The earlier version of the Covenant didn't really promise to be salvific in the same sense as the current version is, so logically it wouldn't have ever been salvific that way. Since it's not the version currently in force, God doesn't have to provide any grace to those currently living under it; but probably He does, because He is merciful and because one can see Jewish people living holy lives and receiving certain graces. This doesn't mean that they don't need to become Christian; and indeed, Jewish converts often receive truly amazing amounts of grace when they convert, as Paul pretty much said about branches getting grafted back in.